Overall, this was a solid outing for Ring of Honor, with their first original weekly show since Best in the World on June 22nd. Each match brought something new to the table and therefore the hour seemed to fly by, unlike certain TV shows from other promotions. However, it did feel like I was sitting in a time machine for most of the episode. With Ring of Honor filming four weeks of television on June 23rd, this meant what I was witnessing was two weeks old, and a lot has happened to ROH in those last two weeks. The biggest change being the departure of The Briscoes, including former World Champion Jay Briscoe, but because of the filming schedule Briscoe is to continue as ROH World Champion for the next three weeks of television, even if the website says otherwise. ROH is in desperate need of a new schedule for Television, and should really stop letting their Champions depart the company whilst still holding gold. Now two weeks ago at Best in the World 2013, we saw Matt Taven retain his World Television Championship in a three way match against both SCUM’s Jimmy Jacobs and Jay Lethal, whilst Eddie Edwards teamed with Davey Richards to defeat Adrenaline Rush. Somehow this all meant that Eddie Edwards was next in line for a World Television Title Match. 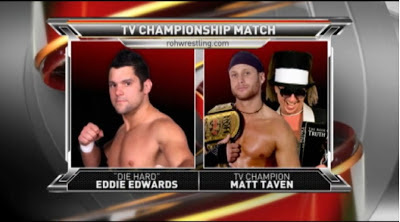 Obviously, Eddie Edwards has done a lot in Ring of Honor, becoming the first Triple Crown winner in company history back in March 2011 and therefore commands a lot of respect within the company, however I can’t quite get my head around the logic that saw him getting a title match here against Taven. I can understand why ROH would want Taven in the ring with Edwards, it just wasn’t explained particularly well in terms of story. The match, of course, was a terrific display of athletism, with both men working hard to create an exciting back and forth contest, that really allowed Taven to shine. The match was soundly wrestled, with a strong technical element with both men coming up with some nice reversals and high spots interspersed throughout the contest to build the momentum into the finish. A nice spot saw Taven get hung in the tree of woe, but instead of facing into the ring, he was on the other side of the ropes, allowing Edwards to hit and impressive dropkick from the outside. Edwards got the fans on his side well, by allowing them to hold Taven as he hit a couple of knife edge chops, much to the disdain of Steve Corino on commentary. Meanwhile, Truth Martini continued to be an asset for Taven helping him garner heat simply by being a ringside. As the match headed towards a conclusion the pace really picked up with momentum switching sides almost constantly for about five minutes. Truth Martini’s involvement was also upped as the match progressed with Martini tripping Edwards from the outside on a number of occasions. Edwards did a lot to help Taven look like a legitmate competitor in this contest, as we saw Taven kick out of a number of Edward’s signature moves which looked to have ended the match. 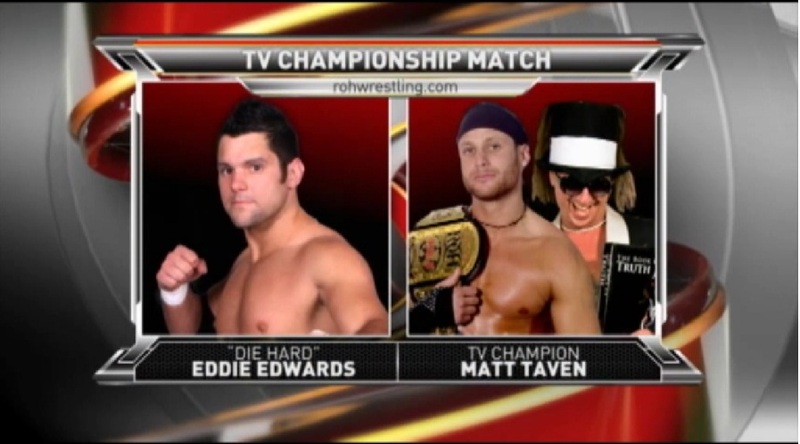 The end saw the culmination of Martini’s involvement as he distracted the referee, to allow Taven to attempt to hit Edwards with the World Television Title belt, only for Edwards to duck, but get distracted by Selezia of the Hoopla Hotties, allowing Taven to hit his Arm Trap Headlock Driver for the three count and to retain his World Television Championship. It was good ending for me, because it looked like Taven didn’t really need the outside interference to get the win, therefore keeping Taven from looking like a weak champion, whilst the interference allowed him to keep the heat following the victory. It’s easier to hate someone who doesn’t need to cheat, but cheats anyway than someone who just cheats. For me, this was the biggest victory of Taven’s ROH career, beating a former World Champion is not something to be scoffed at. The performance as well was also amongst Taven’s best, in match where it would have been easy for him to coast of the ability of Eddie Edwards he did not and brought his A game making this an enjoyable television contest. I can see a lot in the future of Matt Taven and with the House of Truth by his side and what looks like is going to be a long Television Title reign, it looks like Ring of Honor has big plans for him coming up. Elsewhere, Match Maker Nigel McGuiness came to the ring to discuss the Steel Cage Warfare match that will take place on the 27th July edition of the show. McGuiness revealed that Mark Briscoe would be unable to compete in the match, due to injuries sustained at Best in the World. Obviously, we all know the Mark is done with Ring of Honor for the time being and therefore ROH would have to find a replacement. It looked like ROH had found a ready made replacement for Briscoe, when Kevin Steen made his way to the ring. The passion that both men bring to their promos made this part of the segment particularly enjoyable as you really felt what his fued meant to these men. There was some nice continuity as well, which is often forgotten in wrestling, with McGuiness reluctant to allow Steen into the match due to him originally being the leader of SCUM. Before we could get an answer either way from McGuiness, SCUM member Jimmy Jacobs, Rhett Titus, Cliff Compton and Rhino made their way to the ring targeting Steen. With Michael Elgin, Jay Lethal and BJ Whitmer heading out to make the save for Steen, with the two sides battling in side the ring, it would seem like we have our complete Steel Cage Warfare mach for July 27th even if Nigel McGuiness is yet to officially announce Kevin Steen as part of Team Ring of Honor. There was also action involving the Women of Honor, involving Veda Scott and MsChif. This was a good match, not just a good women’s match, but a good match. Thee was clearl psychology going in with Veda playing the plucky young face, and MsChif the wiley and powerful veteran. They also weren’t afraid to go outside the ring either which always adds a different element to these kinds of matches with Veda getting sent into the barricade by MsChif, and take a German suplex onto the arena floor. After a number of near falls for each competitor, MsChif eventually picked up the victory with Obliteration. I’m surprised at the fact that Ring of Honor still don’t have Women’s Championship, with so many talented women at their disposle, surely giving these women something to fight over would only help to develop their division and the exposure gained from Ring of Honor surely help further these women’s careers. Elsewhere Silas Young faced Adam Page in the surprise contest of the night. Before the contest Young cut a misogynistic promo, about the previous Women of Honor contest, saying women should remain in the kitchen and that he was a real man. What followed was a hard hitting brawl between Page and Young that really got the crowd going, impressive considering these two are relative unknowns to Ring of Honor. The highlight of the match for me saw Page superplex Young off the barricade onto the arena floor, which provided some impressive visuals. After some good chain wrestling between the two, Page picked up a shock victory with a victory roll. After the contest Young continued to attack Page and had be physically removed by security. This match really helped to set up both Young and Page, with a good mixture of brutal looking spots and technical wrestling showing what each wrestler can do well. I hope to see more from both in the future. The Number One Contenders to the World Tag Team Championships were also in action as C&C Wrestle Factory faced the debuting Jon Silver and Alex Reynolds. This match was basically there to make C&C looked good heading into their title bout with reDRagon next week on ROH on Sinclair and it did exactly that. With Silver and Reynold getting in limited offence, although just enough to show us they can also go in the ring, C&C’s high flying skills really came into their own. With Adrenaline Rush also appearing on the entrance ramp, C&C turned it up a notch picking up the victory in a good closing sequence with their Over Time finishing move sealing the deal. It’s been great to watch C&C develop as a tag team over the last two years of Ring of Honor and hopefully they will be rewarding with a tag team title run sooner rather than later. A feud with Adrenaline Rush wouldn’t go a miss either! What have I learnt from this weeks ROH on Sinclair? 1. Matt Taven is more than capable of having a fantastic match, he really impressed me this week. 2. ROH remembers continuity, making the show even more satisfying. 3. It is not satisfying however to know that so much has changed since this next three episode have been filmed that a lot of it will be redundant, such as Jay Briscoe's upcoming World Title defense against SCUM's Matt Hardy.